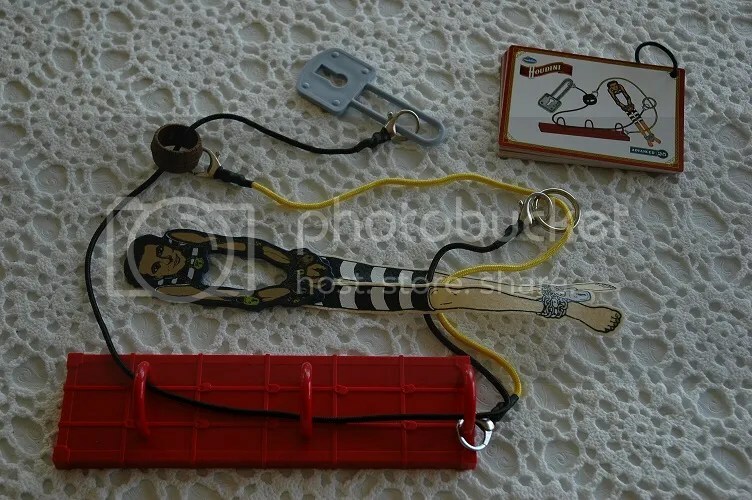 Whether made of wood, metal, plastic, or rope, mechanical brain teasers can be some of the most challenging and well-crafted puzzles a solver will ever encounter. Engaging both the solver’s deductive skills and patience, these puzzles often involve removing one key piece from an elaborate interconnected grouping, be it a ball from a seemingly solid maze of wooden posts or a heart from a web of unyielding metal linkages. 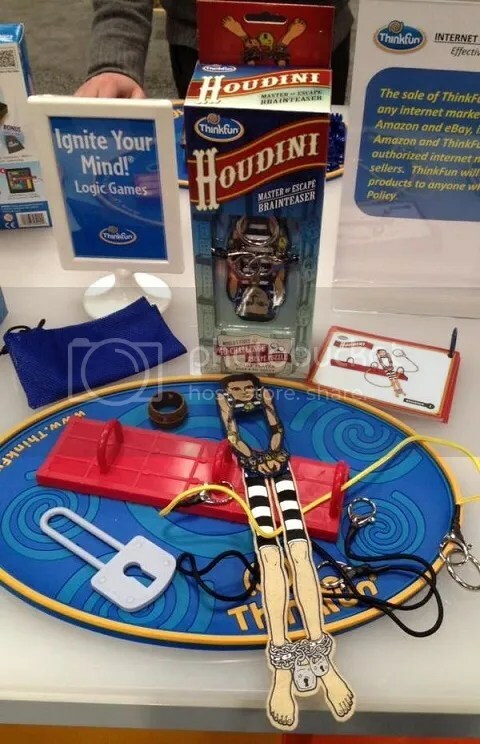 The cunning and clever brains at ThinkFun have put their own unique spin on the mechanical brain teaser with their latest product, Houdini, putting you in the legendary escape artist’s shoes and pitting you against numerous scenarios, all intended to keep the magician’s plastic namesake firmly trapped. Although Houdini’s body and arms are one solid piece — representing his wrists being shackled together — his legs are felt, allowing you to bend and twist them in ways that replicate Houdini’s legendary flexibility. As the ropes are wound around and through both Houdini’s limbs and various obstacles designed to prevent his movement, it’s up to the solver to find the hidden loophole that will allow Houdini to escape scot-free. With only a lock, a barrel, a solid ring, the three-looped base, and a few easy-clip ropes, ThinkFun has conjured 40 layouts of increasing difficulty, and I admit, some of these seriously taxed my puzzly skills. The later puzzles involve multiple steps to free Houdini, utilizing tricks you’ve learned solving the earlier puzzles. It’s a brilliant slow-build solving experience, one that ThinkFun has employed with similar success with Laser Maze, Gravity Maze, and other products. 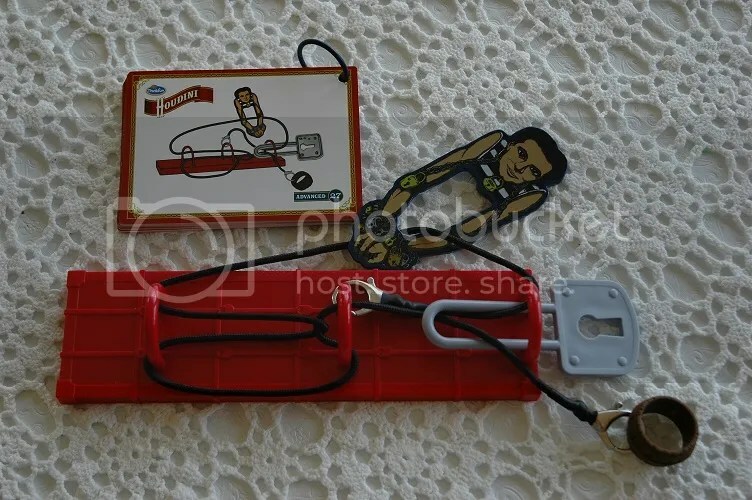 Houdini is not only a wonderful tribute to an entertainment legend, it’s a terrific puzzle toy that introduces a new world of brain teasers to younger solvers. This entry was posted in Games, PuzzleNation, Puzzles and tagged Brain teaser, escape artist, escapology, games, Geeking Out, Gravity Maze, harry houdini, Houdini, Laser Maze, magic, magician, mechanical puzzle, Pop culture, product review, PuzzleNation, Puzzlin' fool, tavern puzzle, ThinkFun by gmdirect. Bookmark the permalink.